Calakmul was one of the largest, greatest and most sophisticated Mayan cities, yet was not discovered by modern man until about 75 years ago. This city-state was at its peak from about 500 to 850 AD. It likely had a population of 50,000. It is named Structure II (see photo above). This construction is as high as a modern 16-story building. You can climb to the top for a breathtaking view of the surrounding jungle stretching to the horizon. However, the stone steps are steep and have short treads. 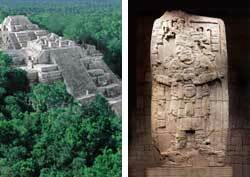 I would hesitantly recommend Calakmul to anyone without at least a basic knowledge of Mayan history and archaeology. Unlike in popular Mayan sites like Tikal, Palenque and Chichen Itza, you and your camera see little of the ruins as you walk around because much of the jungle growth has yet to be trimmed back. You have to take a four-hour ride over so-so roads from Campeche, the nearest city.